Wearing reflective clothing and using proper LED lights at night when walking, jogging, bicycling, skating etc. can save lives! We've all had the experience of almost hitting a dark figure when driving at night. Don't be that dark figure!!! Be SMART. Be SEEN. Do it for YOURSELF! Do it for the DRIVER! Here are some important safety pointers to remember when buying reflectors and LED lights. Be sure your bike reflectors and reflective clothing are visible from a safe distance of at least 500 feet. This will give a vehicle time to slow down and brake if needed. Many reflective materials, especially those used for promotional safety products are of inferior quality and do not reflect very well. Most of our products are made with '3M Scotchlite' and 'Reflexite' reflective materials which are ANSI compliant, can be seen from all angles and from over 1000 feet away. We also do our own testing on our products out on dark roads to ensure that they can be seen from a safe distance in all weather conditions. Note, hard reflectors (the type generally screwed on to bicycles) can sometimes be barely reflective. Below you can see the difference between a hi-quality hard reflector and an inferior one. When there is no light shining on them they look the same. When a light is shining on them you can see the difference. Reflective gear light up only when a light is shining on them. For maximum visibility at all times, including dawn and dusk, use reflectors that have bright colors like lime and orange and use LED lights as well. Be sure all reflective wear is ANSI compliant. Certain colors, as well as inferior reflective products will not meet ANSI criteria. Be sure the reflective items you are wearing are not covered by your clothing. Narrow reflective bands or belts can sometimes be covered by folds and bagging in your clothing. Cyclists should wear a Sam Brown belt or vest rather than a standard belt because the front of the reflective belt can be blocked by the rider as he/she bends over, or by the bike handlebars. The same is true for someone pushing a baby stroller or a wheelchair. Using a bike headlight on the front handlebars is also a good idea. 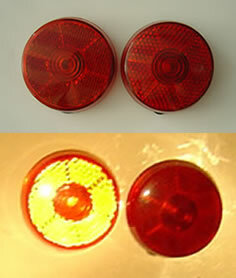 And of course, don't forget a rear light, required by law in some states. Side lights or reflective items that go on your spokes are very important too. Be sure you are visible from the sides. This is extremely important for your most vulnerable time - when approaching intersections. Many running vests only have reflective material on the front and back and many bicycles have poor or no side reflectors. You can use multi purpose lights such as frog or beetle lights, spoke reflectors , reflective armbands, or the like to solve this problem. Vinyl reflective gear, also known as PVC, are better than other materials because they do not lose visibility when wet. PVC reflectors will also stay cleaner and will not be blocked by dirt. Many reflective vests and belts are made with non vinyl reflective material that has great visibility when new but after some wear and tear, or in the rain - when you need it most, it loses reflectivity. Do not rely only on your reflective gear or bike lights to keep you safe. Always obey all traffic safety rules. Don't make the mistake of crossing a road unsafely and relying on your reflectors or lights. One important reason we try not to sell promotional grade reflective material that is of poor reflective quality is because unfortunately someone wearing or using an inferior product may think they are more visible than they really are, causing them to be less cautious, which can lead to a tragedy. Look for LED lights that have a quick flashing mode which is more eye catching than a steady mode. If the strobe light flashes too slowly it may be unsafe because the bike light is off for too long. Also, try to buy bicycle lights that have a reflective lens as well. This way, if your batteries die or you forget to turn on the light, you will still have a bike reflector for your safety. BE SMART BE SEEN! Do it for YOURSELF! Do it for the DRIVER!